Comments: Note – I couldn’t finish this book thanks to some corruption in the audio of the 3rd part. From my experience of 2/3rds of this massive massive book – it starts very well with fascinating insights about the greeks, the romans etc and then fizzles once it enters into the middle ages and become a collection of facts, names and dates. The first part was excellent. The second part not-so-great. 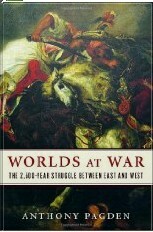 Still, likely a book worth reading if you love history..